Customers are more empowered and connected than ever, with unprecedented access to information anytime and anywhere. Their expectations are high, and their buying choices are based on positive interactions with your brand. Customer analytics can tell you who your customers are, what they are doing, what they want, and how and when to reach them, so that you can create personalized experiences that win more business and drive loyalty. Predictive analytics has become an imperative for organizations as they strive to incorporate data-driven decision making into their processes by understanding potential future outcomes. Prescriptive analytics can then build on this foundation by answering the eternal question "What should we do about this?" 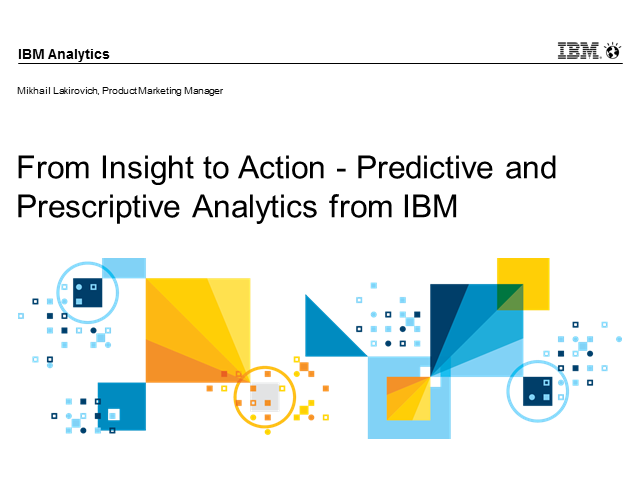 Attend this webinar to learn how IBM SPSS Predictive Analytics can help you uncover patterns and trends in your data and how IBM Decision Optimization can be leveraged to incorporate those insights into optimal decisions. See how IBM analytics lets your understand your data with ease and speed and translate that understanding into value. Everyone's talking about predictive analytics, but you're not sure what it is. This video tells you what you need to know. Embrace social media as mainstream to better understand customers and drive successful business results. Take a look at IBM Customer Analytics, the smarter way to understand and anticipate customer behavior and target your customers with relevant offers. Learn more at ibm.biz/customer_analytics. Learn how you can use IBM's Predictive Customer Intelligence to deliver valuable insights, increase satisfaction and drive revenue growth, both for you and your clients!